Tube bending is a process used to reshape tubing or piping into a certain shape or design. This process works on metal, alloy, aluminum, titanium, and steel. Various methods are used for bending tubes depending on the material in use and the required precision. 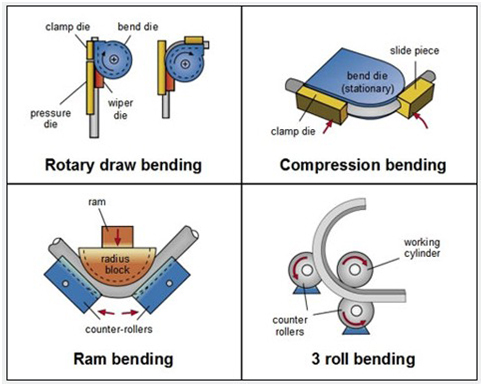 The more common procedures are rotary draw bending, 3-roll bending, compression bending and ram bending (press bending) (Figure 1). When rotary draw bending is applied, the tube is fastened between the bend die and the clamp die. The rotation of both tools around the bending axis bends the tube to the radius of the bend die. The pressure die (slide piece) serves the purpose of receiving the radial stress, which is generated during the forming process, and supports the straight tube end from outside. If a mandrel and wiper die are additionally applied (mandrel bending), a high quality work piece can be achieved even with thin-walled pipes and tight bending radius. When ram bending is applied, bending tool is pressed against two counter-rollers, either manually or by means of hydraulics. This motion forces the tube inserted between the radius block and the counter-rollers to bend around the radius. The tube cannot be supported from within; therefore this method is suitable for thick-walled tubes and large bending radius only. 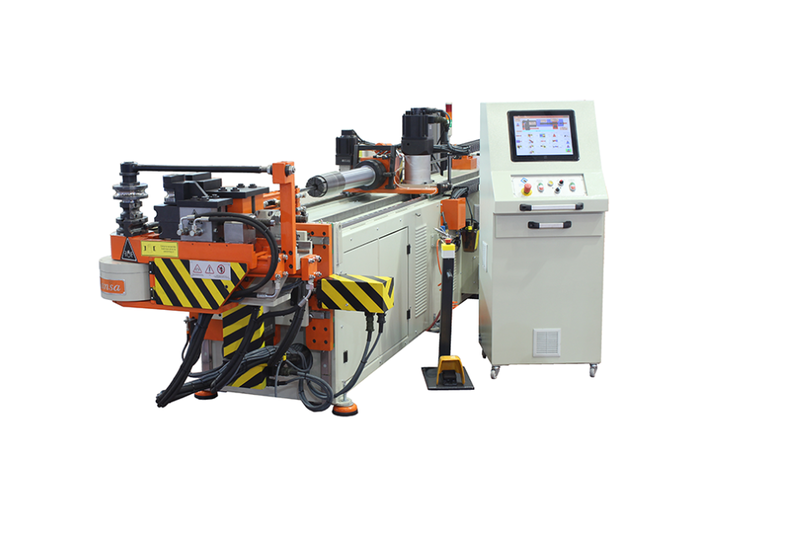 3-roll bending is also used for producing work pieces with large bending radii. The method is similar to the ram bending method, but the working cylinder and the two stationary counter-rollers rotate, thus forming the bend . 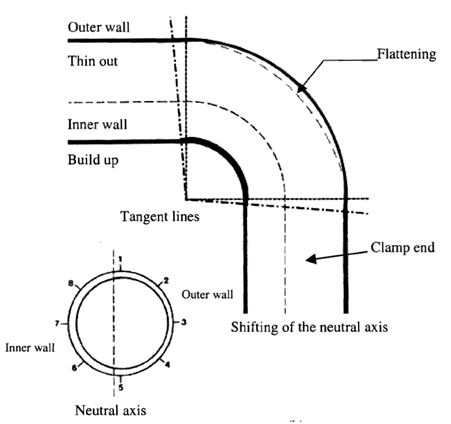 Bending tools for Rotary Draw Bending (Figure 2) were designed during this project. Bend die is the main tool which directs the tube along the rotation axis. 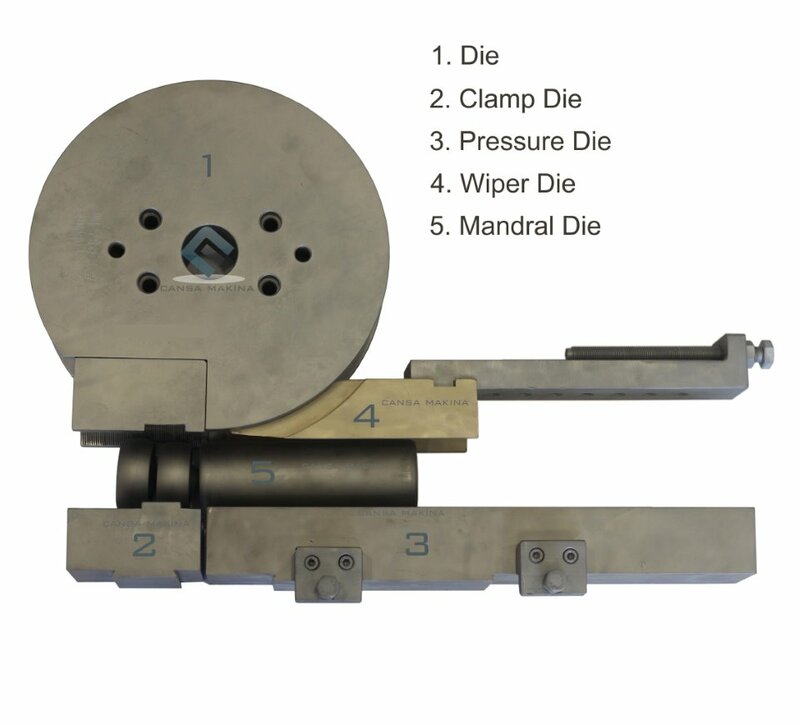 Clamp die meets the bend die and moves simultaneously as it is used for clamping the workpiece. 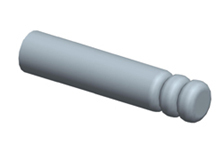 Mandrel is used for preventing the bending area from section shape changes and collapse. Figure 2. Bending Tools . Pressure die is designed to compensate the bending forces and for keeping the tube in the right position it moves linearly along with the tube. 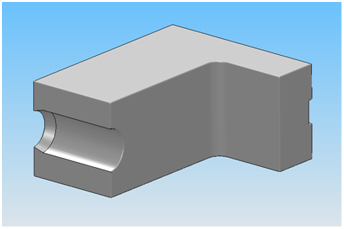 Wiper die is fixtured between the cavity of the bend die and the tube immediately behind the line of tangency. The critical feature of a wiper is the feathered edge, which prevents the terminal hump from exceeding its yield point and setting into a wrinkle . Due to small radius of the tube and sufficient wall thickness, wrinkling will not be crucial so wiper die is not used in order to reduce cost. Detailed explanations of these tools will be given in Tool ion section. Tube bending has a wide range of applications. Bended tubes and pipes are used for business signages, structural purposes, agriculture (e.g. tractor), automobile parts, ornamental and furniture parts (Figure 3). Connection points and standard dimensions of the tools such as die height are designed according to this machine. Figure 5. Tube bending process. 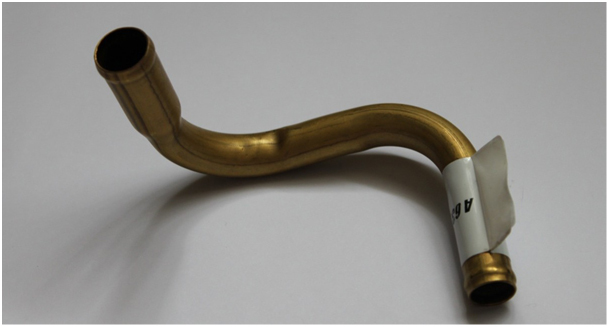 The brass tubes to be bend are shown in Figure 6. and 7.. They have different geometries but the bended parts have the same dimensions, therefore the designed die will be used for both of the tube. Figure 6. - 7. Tubes. Appearance: It is considered important where aesthetical appearance becomes one of the major concerns where the tube itself is mounted on an area visible to the human eye, or simply where the tube itself is a part of an ornamental structure. Flattening should be prevented in order to maintain good appearance. Wall thickness: In some applications, where any pressured fluid passes inside the tube, wall thickness is reckoned to be important, since thinner the walls, smaller the force that it can withstand without being damaged. Geometry: Different tube geometries may require different parameters when forming. For instance, substantial care must taken when forming square tube profiles, Since it is much more difficult to sustain the sharp edges of the profile in the bending processes. 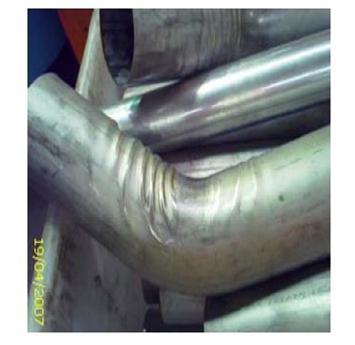 Low wall thickness compared to tube diameter: When the ratio of wall thickness to tube diameter is small to a considerable amount, fracture and wrinkling may occur on the tube walls. There is a limit to the ratio in question for every ed tube material. 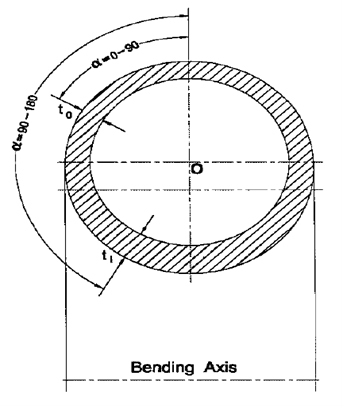 Low bending radius: Change in the bend die diameter changes the bending radius. Bending with low bending radiuses may be critical, since there will be too much tension on the outer side and too much compression on the inner side of the tube which can cause tearing or collapse from the outer side and wrinkling on the inner sides. 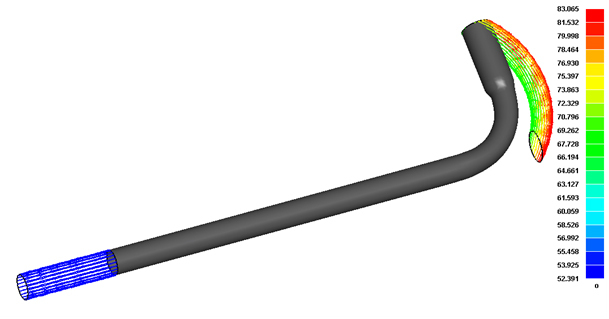 Figure 8. shows a tube after bending process with a small diameter bend die. If the diameter of the bend die was bigger, the tube would be bended without flattening. Figure 8. Bending with small diameter bend die. Weld: Care must be taken when bending tubes preformed with welding. The bending should not be made through the welded area since the welded face may not withstand the tensile forces and may result in failure through its weld seam. Figure 9. Section changes . 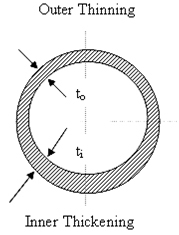 Wrinkling: When working with low bending radius and low wall thickness compared to tube diameter conditions, wrinkling can occur (Figure 10). To prevent this, proper wiper element should be used. Hump on outside of pull off end: There is a clearance of 1mm between bend die and clamp die when holding the tube to bend. This clearance is used so as to better hold the part to bend and prevent it from sliding. Nevertheless, if the bend die and clamp die are to hold the part too tight, humps can be generated through the clearance and it is undesirable. Scratches in clamp area: Scratches in the clamp area can occur if the clamp hold the part too tight. Ball segment bumps in bend area: If the mandrel used had balls and if the size and material of the mandrel was not ed properly, there may be ball prints in the bend area that can be seen from the outside. Scratches on inside of bend area: Mandrel used can make scratches on the inside of the bended area of the tube. Therefore, to overcome that problem, appropriate mandrel radius and material must be ed. Tooling marks on centerline: Pressure die serves the purpose of receiving the radial stress and supports the straight tube from outside. While doing this, it should permit the tube to slip inside it. Because of this, if the pressure die material is not ed properly, tooling marks on centerline can occur. For instance, ductile cast iron can be used as the material which has spherical grains in the microstructure range. That way, tooling marks can be prevented. 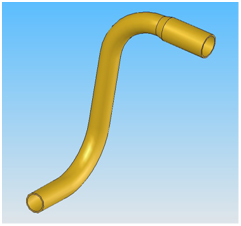 Springback: When the bending process will be over, the remained stresses in the body of the bended tube will cause to a relaxation in the part that will decrease the degree of bending (Figure 11). To solve the problem, the initial degree of bending might be increased to a certain degree driven by the simulation results. 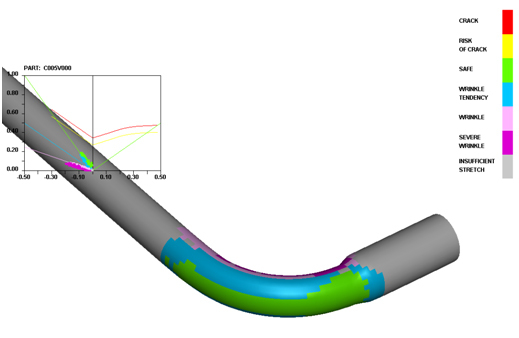 Another solution relies on increasing the elastic modulus (E) of the tube material. Increasing the E means making the part more rigid which will result less loosening of the part after the forces are removed. 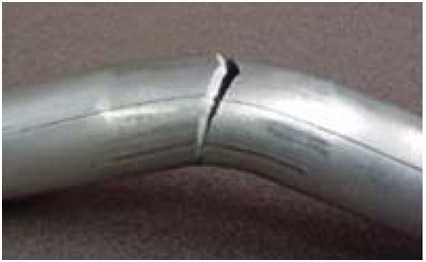 Collapse: If the proper mandrel is not used when bending tubes of low wall thickness to diameter ratio, the outer part of the tube to be bent may not handle the tensile forces and may collapse. Proper mandrel with proper ball size should be ed. Also bending radius must be big enough to prevent collapse (Figure 8). Mercedes Benz Türk gave the project, so tube material and geometry was already determined. Since it is not acceptable just to except it, material comparison is done for radiator tubes between Aluminum, Copper-Brass and Stain less Steel. Radiator tube material needs to have high thermal conductivity, high melting point, high tensile strength and high corrosion resistance in order to prevent failure from hot, highly pressured liquid passing through the tubes. It also needs low specific weight for lighter structures and good solderability for soldering the fins to the radiator. 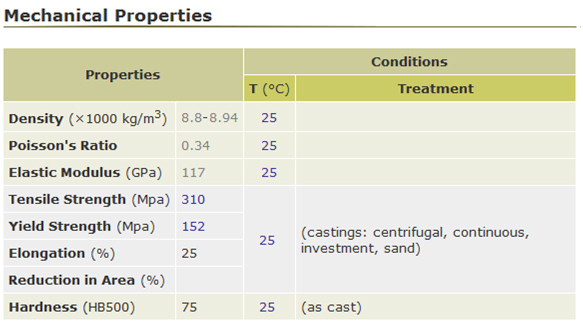 Mechanical and physical properties of Aluminum AA 3003, Brass UNS C26000 and Stainless Steel are shown in Table 1. AA represents Aluminum Association. AA3003 is called Alclad wrought Aluminum alloy composed of %98.6 Aluminum (Al) with %0.12 Cu and %1.2 Manganese (Mn) , . Table 1. Tube material comparison. Stainless steel could be used due to its high tensile strength and high corrosion resistance, but it is very expensive and has a very low thermal conductivity that makes it redundant for the usage area. Aluminum has lower density and better conductivity than brass, but radiator tube strength is equally, if not more, important. Brass, of course, is considerably stronger than aluminum. This overall strength allows for thinner walled tubes to compensate for the difference in conductivity and weight. Table 2. Advantages of Brass over Aluminum. As indicated by N. C. Tang , in tube bending, stresses separated into three components which are longitudinal σx, circumferential σc and radial stresses σr. Since the wall thickness is much smaller than the radius of the tube, radial stress can be neglected. Also the formulas are changing according to the inner and outer sections of the tube. As shown in Figure 13, for the values from 0° to 90° of α is the outer semi-circle of the tube and from 90° to 180° of α is the inner semi-circle of the tube. Figure 13. Outer and inner semi-circles of the tube . Where R is the desired bending radius of the tube and r is the mean radius of the tube cross-section shown in Figure 14. Figure 14. Cross-section of the tube . Figure 15. Stresses for inner and outer sections. Figure 15 is a Matlab graph which shows the results of the stress formulas indicated so far. Vertical axis shows the angle defined in Figure 13 and horizontal axis shows stress values. Longitudinal σx and circumferential σc stresses are indicated in blue and green respectively. 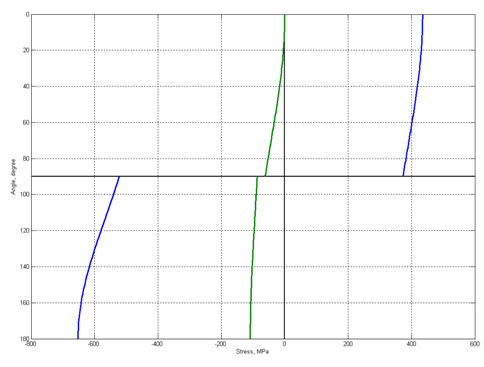 As seen from the graph, in the outer section the longitudinal stress is positive which means it is a tensile stress. And for all other values, the stresses are compressive. Where to is the thickness in the outer semi-circle and t is the original thickness of the tube before bending. Where ti is the thickness in the inner semi-circle. Figure 16. Outer thinning and inner thickening of the tube. Figure 16 is a Matlab graph which shows the outer thinning and inner thickening respectively up and down according to horizontal axis to check whether an anomaly exist or not. 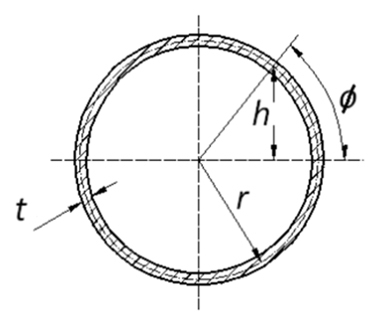 The shrinking of the diameter is caused by the circumferential stress on the tube cross-section. where d is the inner diameter of the tube. Since longitudinal stress in the outer half is smaller than in the inner half, and the outer wall is thinner than the inner wall for balance of the moment of the internal force, the neutral axis should move to its inner side as shown in Figure 17. Figure 17. Natural axis deviation and flattening . Where D is the original outer diameter of the tube. Figure 18. Bending Moment . Where θ is the bending angle. 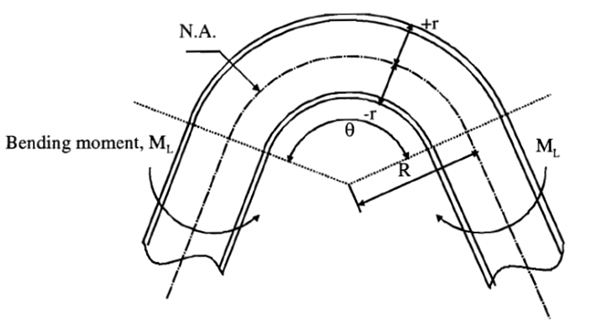 Where θL and RL are the bending angle and bending radius respectively in loaded condition and θU and RU are the parameters for unloaded condition. Analytical calculations made by writing a Matlab code and the results are shown in Table 4. In order to determine the values, formulas were used given so far and in Table 3, 6 basic geometrical and mechanical parameters are entered in the code and results are calculated. 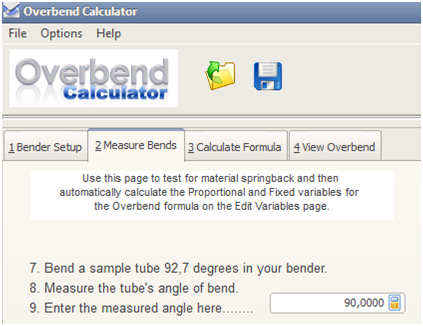 These calculations are valid just for bending a straight tube that does not have any flange in the head. 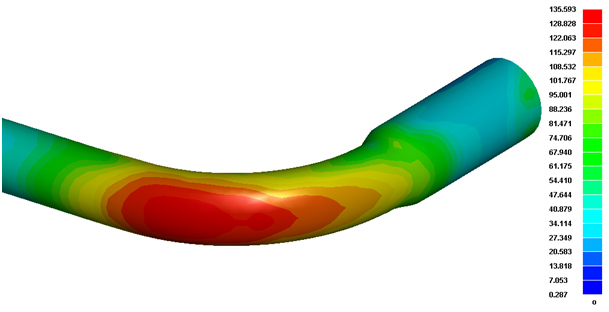 For this project, plastic deformation analysis, made on Dynaform, are shown for the flanged tube in the further sections. Table 3. Basic properties of the tube. Table 4. Matlab analytical calculation results. In Table 4, Unloaded Bend Angle and Unloaded Bend Radius shows the results for bending the tube by 90° (Bending Angle – Table 3). That means if the tube is bended by 90°, due to the springback, Unloaded Bend Angle becomes 87.38° and Unloaded Bend Radius becomes 36.05 mm. In order to get the desired bending angle 90°, Over Bend Angle should be 92.7° and Over Bend Radius becomes 37.13 mm as indicated in Table 4. Tool materials are ed according to the information acquired from the company visits. Firstly alternative materials are discussed, and then material ion is made. Firstly, the pressure die part material is discussed. 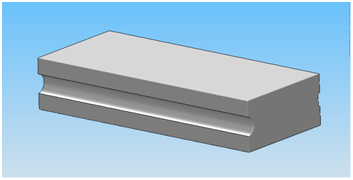 The pressure die should let the material flow without losing its shape because this part stays stable during the bending operation. Ductile cast iron lets the material flow and due to its spherical grains, the flow results without undesired scratches on the surface of the tube. 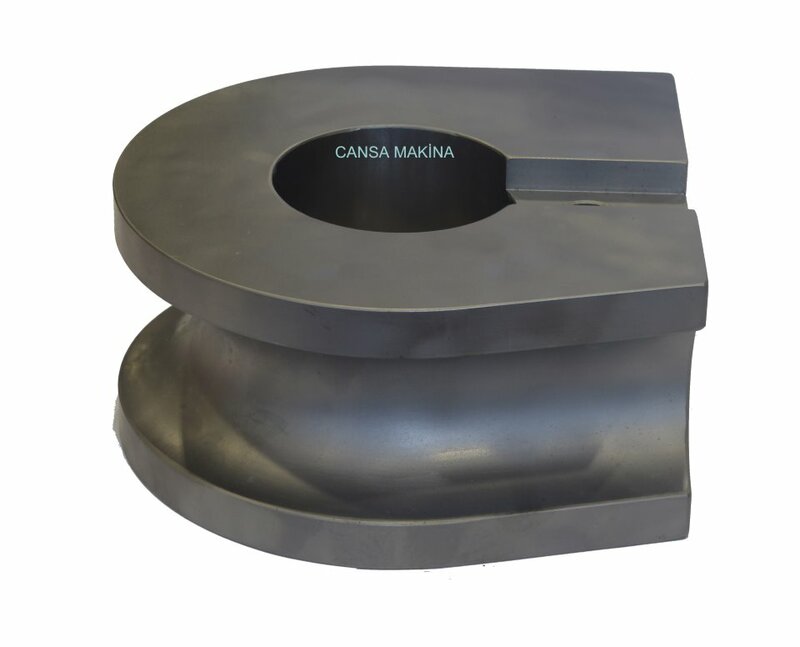 It is stated that ductile cast iron is the most proper material for the pressure die part because of the properties needed for a pressure die. Table 5. Ductile cast iron properties . It is emphasized that if the material of the tube was omium or Aluminum, Ampco Tin Bronze material should be used as the pressure die. Steel or Iron is not suitable for these materials because of the chemical affinity they have for each other. Mechanical properties of this material are shown in Table 6. Table 6. Tin Bronze properties . The material information given so far is about the general material design principles of the bending tool especially the pressure die. The given project requires the same material for the each part of the bending tool. Hence it is decided to take the parts as a whole and to consider them all while choosing the material. In compliance with the company visits, the following materials are incorporated into the general comparison. The comparison of the necessary properties of steels for all bending tools is shown in Table 7. Table 7. Tool material comparison [9, 10, 17, 18]. material that does not create critical stresses on tools. Also the material of the tube is ductile which is formable enough to be bent easily. The tool is not in danger of a failure caused by high stresses in bending operations, since the forces applied are very low. The only problem observed would be the forces that may cause failure of the tube, the calculations are done to prevent this bad result. The only disadvantage about the chosen steel was its hardness which is lower than the others. 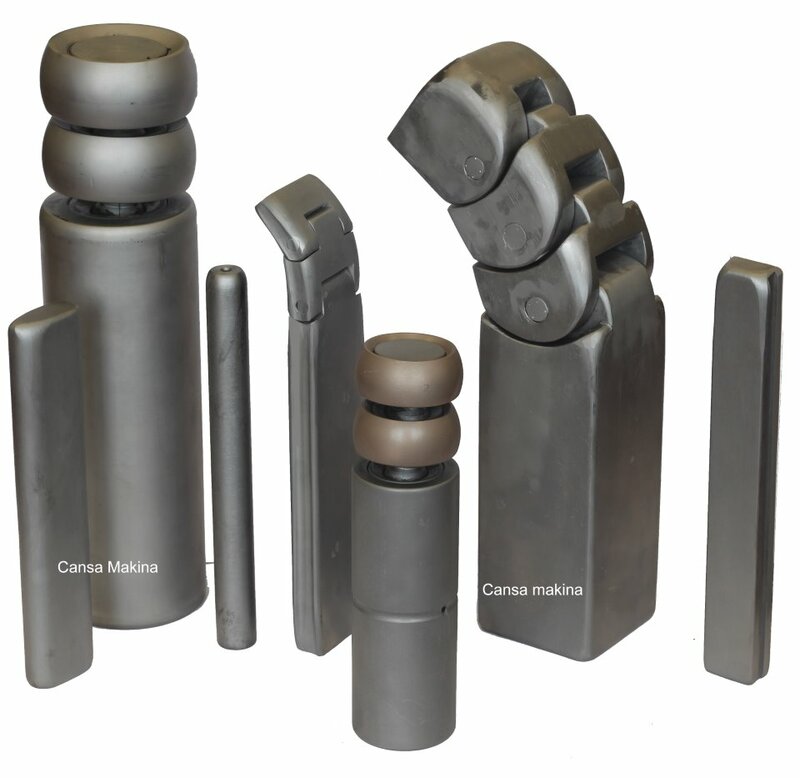 Generally high hardness is desired in a tool design in order to avoid wears. Wear problems in bending operations are not as crucial as other forming operations as a result of low forces and low chemical affinity so that it is not that necessary to choose the other cold work tool materials since AISI 1050 has a sufficient hardness value. where it is a constant approaching zero depending upon limitations of material and method of manufacturing. where it is a constant for material rigidity..
where it is a constant limiting the minimum clamp length depending upon the surface of the cavity and the value of 2 for smooth cavities and 1 for serrated cavities. 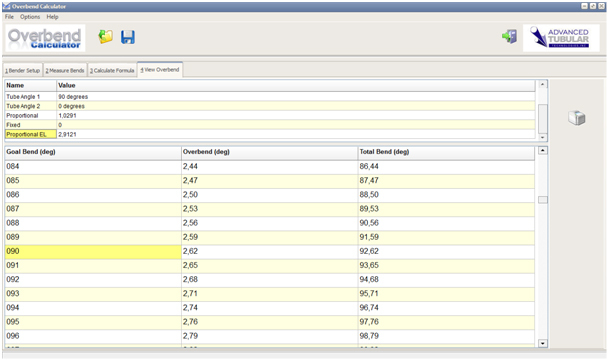 In Table 8, results taken from Matlab is shown which was calculated by using die calculations formulas. Wall Factor and “D” of Bend values are used in the further sections for choosing a proper type. Three types of the bend dies are shown in the Figure 3. The first type is the one with an insert of an interlock. 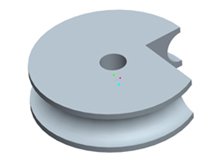 The second type is a bend die that has concentric bore inside and the third type is a one piece die with no inserts. With respect to the project given the bending machine is a constant parameter of this tool design. One piece bend die is the type suitable with the bending machine out of these three types. More importantly it is shown in the figure that this type has no interlocking part and also no inserted blocks. Furthermore the dies used in the company had non insert interlocking regions and the design is made conforming to the dies currently used and the designs made for the same machine before. The pressure die is the part that holds the tube and lets the tube flow while bending operation is happening. 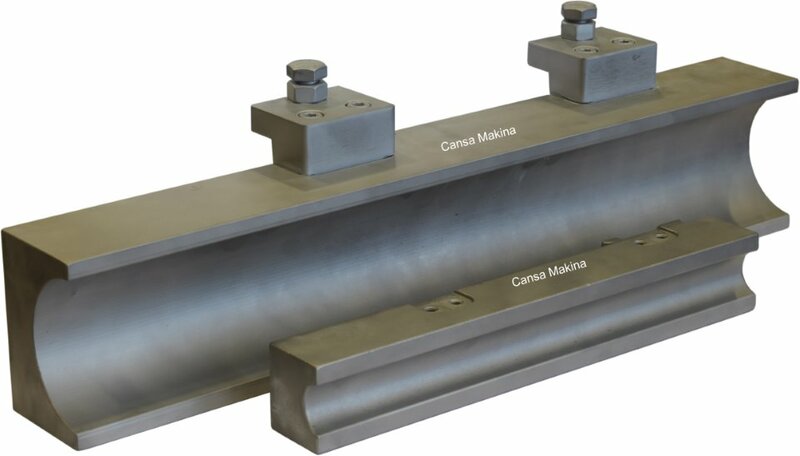 The main mission of the pressure die by letting the material flow is to provide the maintainability of the tube?s dimensions without losing its shape. For mandrel ion “D” of bend and wall factor is important. The “D” of bend is calculated as 2.33 (taken as 2.5) and the wall factor is calculated as 15 that can be seen in Die calculations section. 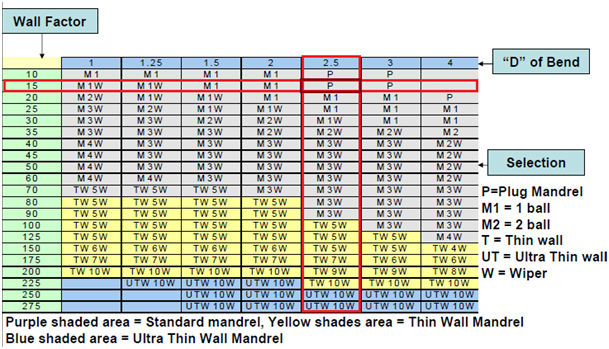 According to these values the appropriate mandrel is a plug mandrel as shown in the ion chart (Table 9). Table 9. Mandrel ion chart . Figure 23. Mandrel types . Mandrels with balls provides better geometries while bending especially for the tubes of which diameter to thickness ratios are too large. Disadvantage of these ball mandrels is that they have less tool life than plug mandrels. 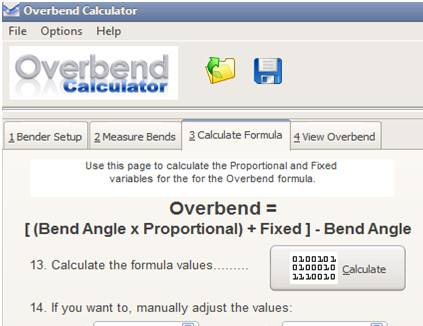 Technical drawings for manufacturing are given in Appendix A.
Overbend Calculator is a program for finding the necessary bend angle considering springback. First step is Bender Setup, where you enter the degree of bending (Figure30). This value is currently used by company and acquired from previous bending processes. 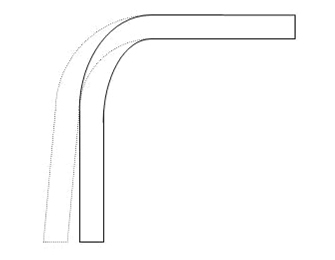 For example to get a 90 degree bended tube they bend 92.6 degrees. Second Step is Measure Bends, where you enter the degree after bending when springback occurs (Figure 31). In third step the program generates formula values (Figure32) and at the final step you can see the results. 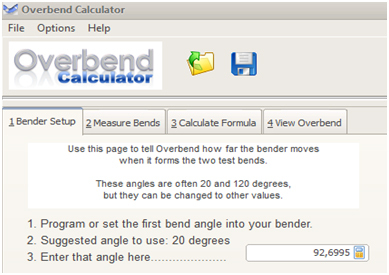 The Overbend page gives you the angle of bend you must enter to the machine according to desired bend angle (Figure 33). 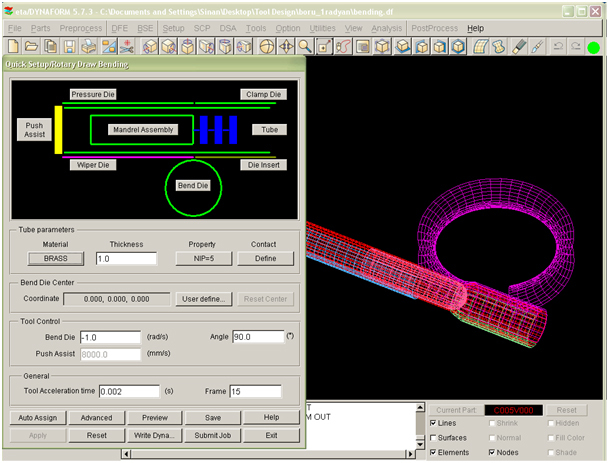 eta/DYNAFORM Version 5.7.3 software is an LS-DYNA-based sheet metal forming simulation solution package developed by Engineering Technology Associates, Inc. Dynaform has a Quick Setup module as a Rotary Draw Bending shown in Figure 34. After drawing each of the tool and tube as shell by using Surface Tools on SolidWorks and saving them in the .IGS format, every part is imported into Dyanaform one by one. 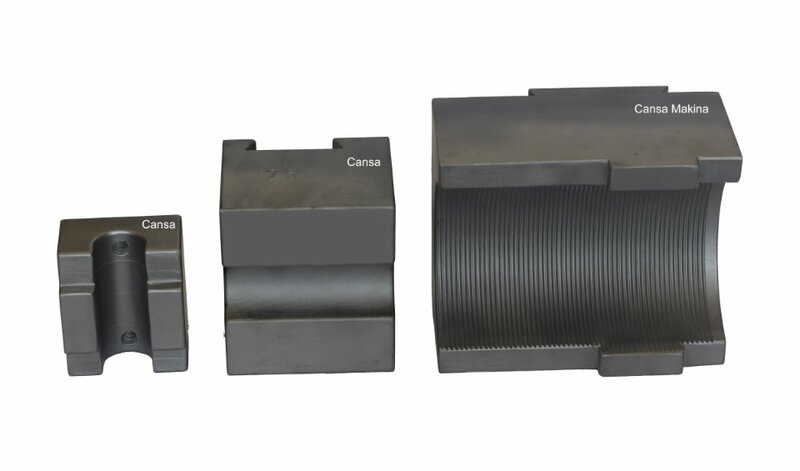 Tools and tube material are meshed as shown in Figure 34 and defined separately in the Rotary Draw Bending Module. This module assumes tooling materials as rigid and also contact interface between tools and tube are „forming_surface_to_surface?. After analyses finished, the results is examined with the Post-Processor for Daynaform as shown in Figure 35. This finit element analysis results are discussed in the further sections. Figure 34. Dynaform Rotary Draw Bending Quick Setup. Figure 36. Definition of major and minor strain . As shown in Figure 36, bigger value ε1 is considered as the major strain and placed in vertical axis. Smaller value ε2 is considered as the minor strain and placed in the horizontal axis in the Forming Limit Diagram. Figure 37. Forming Limit Diagram. Figure 38. Change in the geometry around bending area. 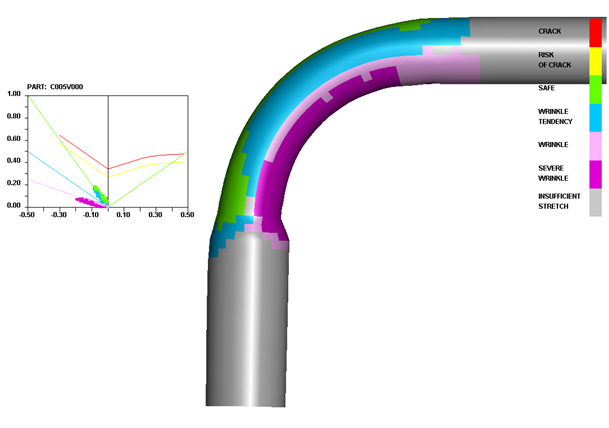 As it was mentioned in the previous sections due to the compressive stresses in the inner section of the tube walls, wrinkle formation tendency can be seen, as in Figure 37 and Figure 38 colored pink and purple. Also the cross-section of the tube changes while bending. The shape of the tube in the bending area is not an exact circle anymore. The change in the geometry can be seen clearly in Figure 38. From the Forming Limit Diagram, it is observed that the bending operation is very far away from the risk of crack. Therefore this bending process is safe under these conditions as desired and calculated before. Figure 39. – 40. Von Mises Stress distribution. After bending operation, since tube bending is a plastic deformation process, stresses shown in Figure 39 and Figure 40 are the residual stresses. These stresses are small compared to yield strength of brass. 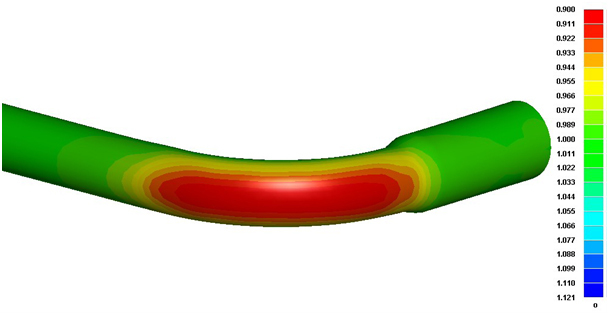 Thickness distribution is one of the major concerns in the bended area that affects the strength of the tube directly. Therefore this distribution should be examined carefully. Figure 41. Thickness distribution on the outer semi-circle. Figure 42. 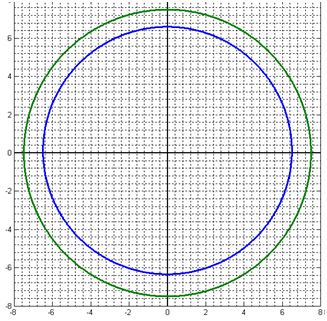 Thickness distribution on the inner semi-circle. As mentioned before, due to tensile strength in the outer section, wall thickness of the tube decreases from 1mm to 0.9 mm the same as found in the analytical calculations. Thickness distribution can be seen and read from the scale in Figure 41. Also because of the compressive stress in the inner section, maximum wall thickness increases up to 1.12 mm shown in Figure 42, that is very close to the analytical solution of 1.16 mm. Figure 43 shows the edge movement of the tube according to the starting position. In other words, for the edge on the left of the Figure 43 means preparation length that was calculated as 56.51 mm in the analytical calculations before and also closely fits with the results as navy blue in Figure 43. Figure 44. Forces on tools. Forces acting on tools are plotted in Figure 44. It can be seen that values on X and Y axis are not critical to deform tool material. Due to the bending geometry there is no force acting on tools on Z direction. 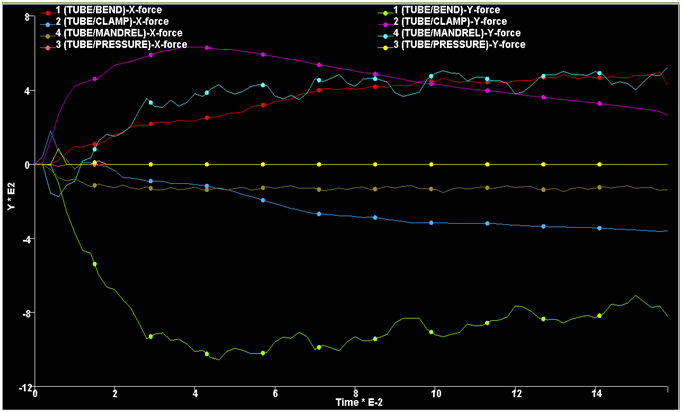 Since there is no chance to give degrees of freedom for mandrel while setting up the model in Dynaform, all forces acting on mandrel in the graph will act on pressure die in reality. This forces show the importance of wear resistance rather than tool strength especially at high amount of bending operations.